One of the most important "must have" accessories for your 'T' is the Model T Ford Transmission Accessory Screen. It's not about being able to boast that you have a rare period accessory and certainly does nothing to add to the authenticity or maximum speed you can do - the transmission screen is quite simply about reliability and longevity. In my view, especially if using cotton bands, the transmission screen is one of the best Model T Ford accessories you can have. Call it a design flaw or idiosyncracy of the Model T Ford, but the nature of the original design of the transmission, using cotton bands as a friction material, means that the transmission slowly 'pollutes' the engine oil with lint from the bands. The Model T Ford engine relies solely on splash oil lubrication and generally, the flywheel and dippers on the bottom of the conrods do a pretty good job, but, the engine has an internal oil line fitted. As you can see above, the oil line, which is fitted snugly to the back of the engine block with the magneto coil plate, has a funnel one end and a narrow (about half an inch diameter)pipe that runs internally to the front of the engine block. This ensures that there is a sufficient oil flow to the front bearings for lubrication. The design, size and location of the pipe ensures that over time, it slowly blocks with lint and sediment, thereby restricting the oil flow to the front of the engine. Cleaning of this pipe is time consuming and fiddly, requiring a fair bit of disassembly. You might think that if you don't have cotton band linings, that this won't benefit you, but you could be wrong! I ran Kevlar bands for many years and still found a light collection of magnetised 'fur' all over the magnet in the transmission screen. If you use wooden band linings, you will also find fibres released into the oil. I think the transmission screen is pretty cheap insurance really.. So what does the screen do? 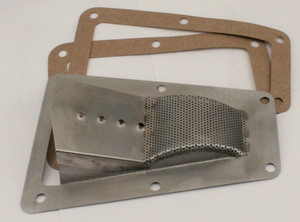 When it comes to Model T Ford accessories, the transmission screen, is very quick and easy to fit. It works simply by filtering the oil of the engine as it is splashed around. 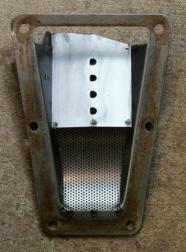 The transmission screen is fitted between the transmission inspection cover and the hogshead. At this point, there is a considerable amount of oil splashed around, it hits the inspection cover and normally drips back down onto the transmission bands. With the transmission screen in place, the oil drips back down into the transmission through the screen. 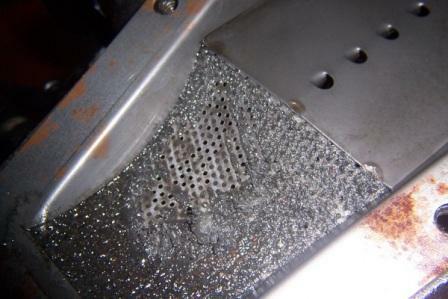 whilst the magnet attracts any metallic contaminants. Considering buying a screen for your Model T Ford Transmission? Have a look at the Model T Ford spare parts page here.